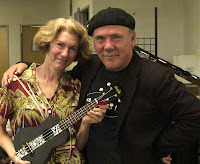 Georgina Keir was the winner of the Kala Ukadelic Tattoo soprano at the Play Ukulele By Ear workshop at Ukulele University, Northridge Music, Citrus Heights, California on Saturday, June 4th. We had a full house of folks wanting to learn how to get off the sheet music and play the fun way, by ear. Thanks to Stu, Arthur and the whole gang at Northridge Music for hosting such a successful event. If you live in the Sacramento area, the Ukulele University is a great place to get started on the uke or simply show up for a great jam session. See you all next June!